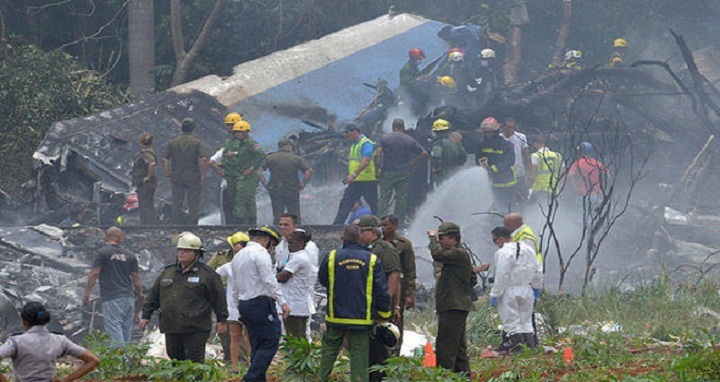 Dhaka, 19 May, Abnews: A Cuban state airways plane with 110 passengers and crew on board crashed shortly after taking off from Havana on Friday, leaving a mass of twisted and smoldering fuselage, as the country's president warned many people were feared dead. Two victims were Argentine, the country's foreign ministry said. Most of the others were Cuban, according to state media. The plane -- carrying 104 passengers -- was almost completely destroyed in the crash and subsequent fire. Firefighters raced to the scene along with a fleet of ambulances to put out the blaze. Cuba's President Miguel Diaz-Canel, who visited the scene, told AFP authorities feared the worst. "The news is not very promising -- it seems that there is high number of victims," Diaz-Canel said. The 58-year-old president, who succeeded Raul Castro as the communist island's leader only last month, appeared aghast as he surveyed the recovery efforts, wearing a short-sleeved green shirt and surrounded by officials. Raul Castro sent condolences to families of the victims of the "catastrophic accident," a statement read, as Russian President Vladimir Putin and a string of Latin American leaders also expressed sympathy.